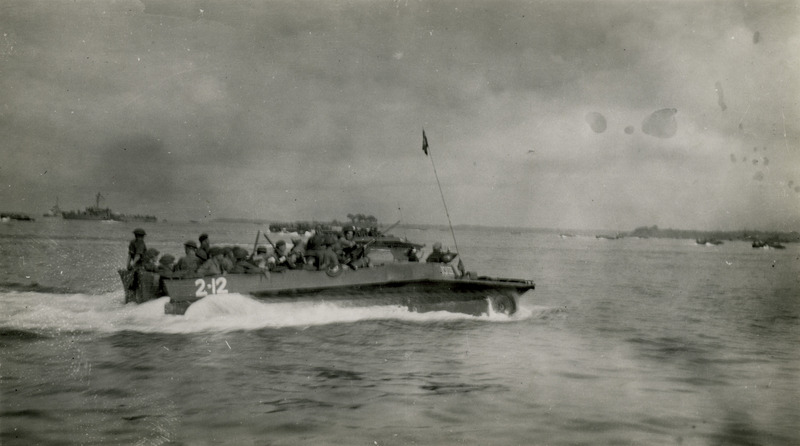 "LVT assault wave on Labuan. 727th Amphibian Tractor Battalion LVT loaded with soldiers of the 43rd Austrailian Infantry Battalion, 2nd wave." William Ammon Stover was born on 15 March 1926 in Williamsport, Pennsylvania. He joined the United States Navy Reserves in April 1943 and graduated from the Navy Hospital Corps School Norfolk Navy Hospital in Portsmouth, Virginia in September 1943. Stover served aboard LST 585 in the PTO as a Pharmacist's Mate, Second Class. Stover left LST 585 on 2 November 1945 and was transferred to a fleet pool in Okinawa and then served on USS LSM 273. He was discharged on 2 March 1946 at the Sampson Naval Separation Center on Lake Seneca, New York. During his service he took part in the Lingayen Campaign, Tarakan Island, Dutch Borneo as well as the landings on Bataan Island and Corregidor Island. In 1948 he married Carolyn Margaret Russell. After the Navy, Stover attended Bucknell University and worked as a technical illustrator, writer, and editor. He spent ten years with Bell Aircraft in Buffalo, three years with GE in Syracuse and Oklahoma City, and six years with Texas Instruments in Dallas, Texas. He later owned, operated, and retired from a Kwik-Kopy printing company. The collection consists of items from Nagasaki, almost 400 letters between Stover and his mother, as well as 31 photographs taken in the PTO during Stover's service.